The Society for Creative Anachronism, Inc. (SCA) is a non-profit educational organization devoted to study of dedicated to researching and re-creating the arts, skills, and traditions pre-17th-century. Most of its activities take place in the context of a social structure adapted from the forms of the European Middle Ages, which allows participants to take a first-hand look at various aspects of the life, culture and technology of the times under study. It is part of the “living history” movement, which means that members try to reproduce various aspects of the culture and technology of their period, as well as doing more traditional historical research. The SCA sponsors events such as tournaments, feasts, and university sessions where members dress according to medieval and Renaissance styles, and participate in activities based on the civil and martial skills of the period. The main focus of many SCA events is a form of combat based on the tournaments of the High Middle Ages. Participants wear replica armor, and use weapons made from rattan, which have the balance and handling properties–but not the lethal effect–of the originals. They fight on foot, as was done a good part of the time after the mounted courses were run, following a system of rules which permit a realistic sport while promoting a very high safety record. Extensive training is required, and all participants sign waivers of liability. Besides combat, activities include costuming, armoring, and combat arts (including archery and rapier combat), calligraphy, dancing, music, cookery, and board and field games, plus a variety of technical and social skills which help establish the ambiance of life at a period court. 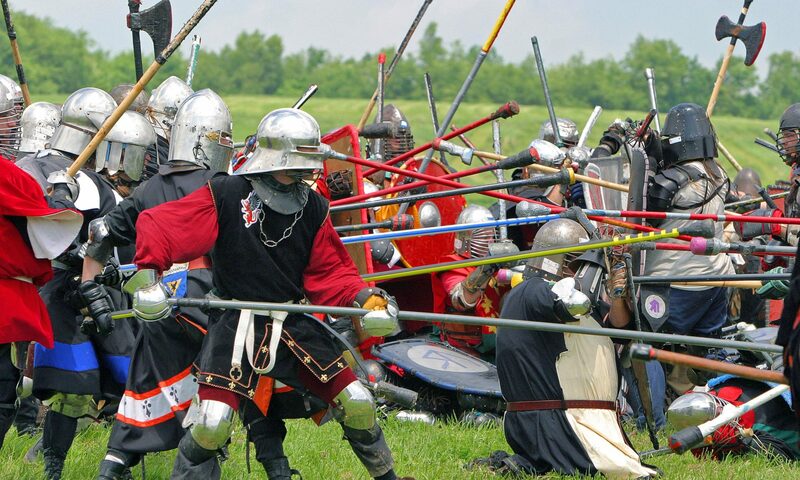 Society events are open to the public, but, in keeping with the emphasis on living history rather than dramatic performance, all attendees are expected to make an attempt to preserve the atmosphere and fit in with the SCA’s standards of dress and behavior. There are tens of thousands of active SCA participants, who administrate local chapters of the SCA in all fifty states, plus dozens of countries abroad. There are over 30,000 paid members of the corporation, and the total number of participants is around 60,000 people.